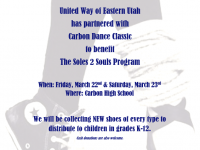 With your generous support we have been able to provide shoes for low income children in both Carbon and Emery Counties. Our desire is to continue this program and we can't do it without your support. We are so very grateful to the dance studios who have given of their time and talents to put on this show!! !